On Monday morning our group traveled to the nearby village of Nabi Saleh, another prominent community in the Palestinian nonviolence resistance movement. You may have heard recently about Nabi Saleh from this New York Times Magazine cover story by Ben Ehrenreich last March. If you haven’t read it, I highly recommend it – I believe it is by far the most thoughtful consideration of this movement by the mainstream media. Although this was my first time in Nabi Saleh, I met Bassem Tamimi, one of its most prominent leaders briefly in Ramallah on our congregational trip to the West Bank in 2010. 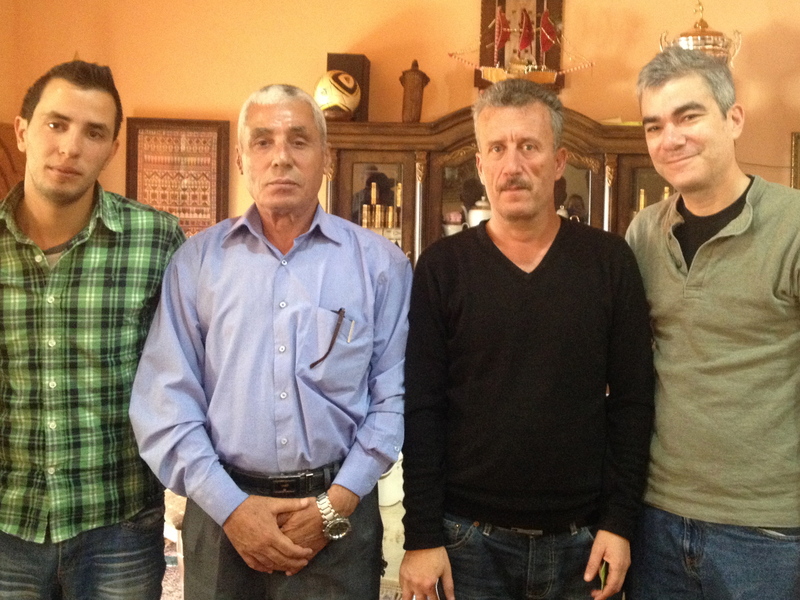 That’s me above with Bassem, his cousin Abu Hussam Tamimi and nephew Mohammed Tamimi. Our group spent several hours in Abu Hussam’s home learning about the history of Nabi Saleh and its place in the greater popular movement. Bassem explained to us that unlike other villages, Nabi Saleh’s protest is not directed toward the separation wall, but rather the confiscation of the village’s lands and the takeover of its spring by the nearby Israeli settlement Halamish. The protest movement in Nabi Saleh began when Bassem and other village members met with and learned from leaders of similar demonstrations in Budrus and Bil’in. Rejecting the violent resistance of suicide bombers in the Second Intifada, they consciously sought a return to the approach of the First Intifada – a nonviolent popular grassroots resistance that evolved into a coordinated mass movement. The village leaders of Nabi Saleh studied the work of Ghandi, King and Mandela – knowing at the same time that the Palestinian nonviolent movement had its own unique context and would have to have its own unique characteristics as well. Nabi Saleh launched its first demonstration on December 9, 2009 – the anniversary of the First Intifada – and since that time, it has been an critical link the chain of the Palestinian popular resistance. Like Bil’in and other villages that hold weekly demonstrations, their protests have been met with visceral force from the Israeli military. Protesters have been regularly met with tear gas, shot with coated steel bullets and sound grenades and sprayed with skunk water. These “crowd-dispersal” weapons invariably cause painful, often grievous, physical distress – and almost all of these armaments are manufactured in the US. Bassem and the other leaders of the Nabi Saleh resistance have suffered profoundly for their efforts. Bassem has been arrested twelve times by the Israeli military – at one point spending more than three years in administration detention without trial. His most recent arrest took place on March 2011 and led to a year-long prison term. He was released one year later. Tragically, like other villages Nabi Saleh now has its own martyrs: Mustafa Tamimi was killed when he was shot in the face with a tear gas canister at point blank range in December 2011. And on November 2012, Rushdi Tamimi was killed after being shot in the head while protesting the Israel’s military attacks on Gaza in November 2012. When I asked Bassem about the status of the Palestinian popular movement, he responded that while it is still growing, and despite the ongoing weekly demonstrations of ten to fifteen villages every week and the proliferation of popular committees, they are still far from the “Third Global Intifada” that he and other Palestinian nonviolence are advocating. Bassem and his fellow leaders seek nothing less than a worldwide movement that seeks to leverage the power of nonviolent resistance – including Boycott, Divestment and Sanctions – to eventually shift this unjust balance of power. Still it is clear that they these leaders are settling in for the long haul. And the fact that Israel reacts so strongly and violently to these efforts that it takes such a prospect very seriously indeed. 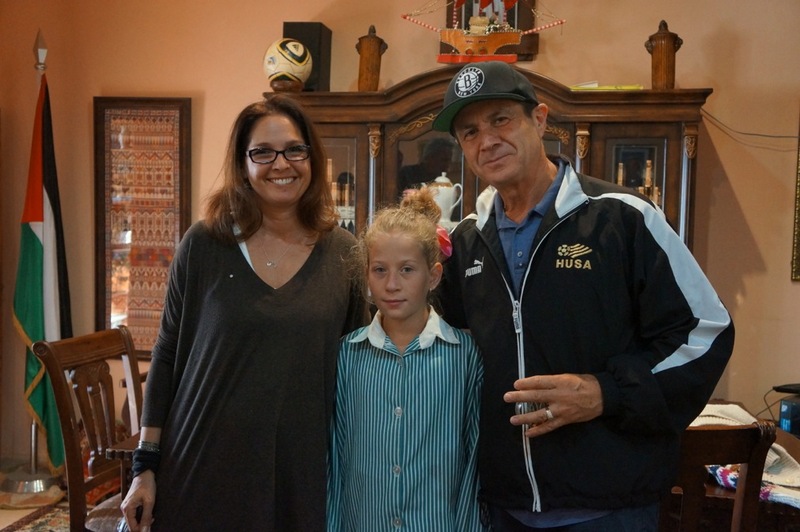 We’re actually meeting and spending time with many amazing children growing up in activist families during our stay here. I will be writing more about this subject – among many others – in upcoming posts. Please stay tuned. This entry was posted in Bil'in Solidarity Delegation 2013, Human Rights, Israel, Nonviolence, Palestine, War on October 22, 2013 by Rabbi Brant Rosen. Certainly wish I had the language knowledge – I’d like to know what the children were saying – and the “smiles” from the soldiers – the photographer, was he from the village or a visiting photojournalist? We have nothing but admiration for the these children and their parents and continued prayers and works to help them be free again one day. Brant, thank you so very much for sharing your experiences and insights with us.